The Contain-A-Pet pet containemtn fence system which includes the transmitter (wall unit) and the electronic collar (electronic box attached to the collar) is basically a mini computer. The transmitter sends a digital signal through a wire buried around your property. Your dog or cat wears a small receiver that is searching for that signal. Your pet is conditioned to stay in the safe areas of the yard. If your pet gets too close, the collar will activate and give either a tone or a correction/tone depending on the setting. Your pet is safe and sound on her property and you can enjoy life a little easier. Knowing you have done the right thing for her and the smart thing for your busy lifestyle. Contain-A-Pet's professional dog trainers recommend the settings to be set so that the collar tones and corrects at the same time. These are sound pet behavior principles that will save you worry, save you money and more importantly, save your pet's life! Look at it like this. Your conditioned pet knows her boundaries by her sense of smell and repetition. If you provide a warning each time, you are teaching your pet to test the boundaries. Each time she tests the boundaries, she may get corrected ... and it's not her fault!. In addition, she is also draining the batteries in the electronic receiver collar. One day there will be no tone, she can keep going ... right on out of the yard! The receivers are called the Omni7000 Mini and The Big Brother. They come in two sizes so that any size dog or cat can wear them comfortably. The Omni7000 weighs in at just a tad over 1 ounce. This is the perfect choice for small dogs and mild tempered large dogs. It is the receiver collar of choice for the cat fence (Yes, we contain cats as well.). From the smallest of dogs and cats to even medium and large sized dogs, the Omni7000 is one of the greatest technological advancements in the electronic pet fence industry. The Big Brother weight is only 1.5 ounces! The Big Brother has the strongest correction for its size in the industry! It will contain even the most determined dogs. Dog containment is not a worry. Remember, we guarantee it! Both electronic collars carry a limited lifetime warranty on the electronics. You will never have to worry about buying a replacement collar again due to failed electronics again! 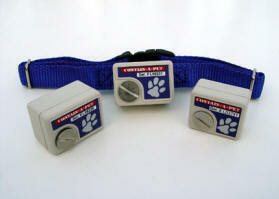 State of the art digital technology to insure the collars will not activate on false signals. Contain-A-Pet has an automatic fail safe feature called Pet Protect so that if a pet gets caught in the field, the units will stop correcting after 13 or 25 seconds and go into tone only mode. They can be programmed to different correction levels. This allows our trainers to customize the receiver to the personality of your pet. Contain-A-Pet has the On-Board Trainer that no one else has in the pet fence industry! This Trainer will monitor how many times a pet tests the field in a 20 minute period. If the pet tests 3 times in this period, it will automatically adjust to the next correction setting. Another Contain-A-Pet exclusive is our Battery Alert for the receiver. The receiver can be programmed to "tone only" if the battery drops below a set voltage. This is another fail safe device to prevent your pet from running away from the property. Still another Contain-A-Pet "only feature" is Retreat Technology which reinforces the corrected pet's retreat to prevent her from lingering near the boundary. Made in the USA. We all do what we can for our country because it is our home. The Big Brother is on the Left and the Omni7000 is pictured on the right and the center. Our receivers are designed to do one thing better than anybody - keep your pet in your yard where she belongs! I am a horse trainer and have many clients that come to my farm for instruction. Many days I am outside for several hours at a time. I always had the feelings of guilt that accompanied leaving the dogs inside when they could be outside with me. If only they wouldn’t run off. I could not keep track of the dogs and effectively teach my clients. Contain-A-Pet has allowed my dogs to be out with me in the barn to do chores or out with me while I instruct. Those feelings of guilt are no longer an issue! And Wyatt, Denver and Daisy love being out with me! Tony was fabulous to work with. He was prompt, professional, and genuinely a nice person. We had a very large area enclosed with the pet fence system and he was finished in one day. We had thought about doing it ourselves, but we are so happy that we did not attempt it. It obviously takes knowledge and experience to do the job correctly and Hidden Fence did that for us. Having Tony put in the pet containment system was worth every penny! I have recommended Tony and his company to another friend who gives Tony kudos for a terrific job. She has two small children and four dogs! She now feels re-born! I will continue to recommend him at every opportunity. Here is a picture of Wyatt running back to the house after our last big snowstorm. It is a pleasure to see the dogs run free and play, not to mention not having to chase them down in nasty weather. Thanks Tony! The Contain-A-Pet Transmitter - From a Quarter of an Acre to 50 Acres. It Does it All! The Contain-A-Pet Transmitter can do it all. Size makes no difference. Many companies offer different transmitters at different price points. 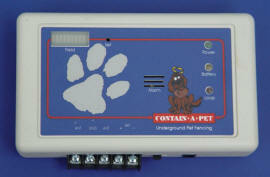 Contain-A-Pet offers one transmitter that does it all. The transmitter is fully manufactured in the USA. In these uncertain times Contain-A-Pet is doing all it can to keep our economy and country working. In addition, we believe the quality of our product is light years better than those products made in China. Contain-A-Pet offers its Lightning Safe feature. It is the only audible lightning alarm in the world. It doesn't work all the time due to the complex nature of power surges from lightning; BUT, we feel anything we can do to add to your pet's safety is important to us all. The transmitter is made tamper proof to prevent accidental setting changes that can effect your pet's safety and well-being. The transmitter casing also keeps insects from nesting in the units and compromising the system integrity. Believe it or not this can be a problem. The unit has an audible wire break alarm with a visual LED indicator light. This unit will tone an alarm and the red LED light will go out if your wire is cut. Contain-A-Pet also offers battery back-up capability. When your power goes out, your electronic fence continues to operate keeping your pet safe at home where she belongs. It Keeps an Eye on Your Pets Even When you Can't! The Portable Contain-A-Pet Wireless Indoor Transmitter is really the product that launched Contain-A-Pet in 1995. As a dog trainer, I constantly had clients tell me their dog would get in the trash or on the furniture or in places they did not want them to. The clients, if properly motivated and consistent, could prevent the pets from going in these "off limits areas" when they were present. The problem occurs when they are not present. Enter the Portable Contain-A-Pet Wireless Pet FenceTransmitter. Properly placed with proper conditioning the wireless pet containment system keeps your dogs or cats out of these invisible areas 24 hours a day. This is sound behavioral conditioning at work. Consistency is the key. So simple. So effective. I wanted to write and let you know how pleased I am with my new electronic dog Fence from Contain a Pet. My two beagles seem so much happier with their new found freedom. Winnie is a very shy dog and also very jumpy. Since the dog fence has been put in and she can go outside whenever she wants, she appears to be more confident and relaxed. Both Sadie and Winnie just love to go out and lie in the sun without any leashes attached to their neck. It used to be that they would just go outside, do their business and come right back in. Now they just love to be outside. What a blessing this is for us. You did such a great job with the installation and the dogs’ training and I would highly recommend Contain a Pet Fencing to everyone! There are many uses for the Indoor Containment System for dogs and cats. The Portable Contain-A-Pet Transmitter does not need the outdoor electric pet fence to do its job. It can keep your pets out of unwanted areas by itself. You can keep your pet's from scratching expensive doors as doors can cost in the hundreds and even thousands of dollars. Hate coming into the kitchen and finding trash everywhere? Not a problem. Can't figure out how all the hair gets on your favorite chair? Strategic placement of the Portable cures all ills magically! Your cat sneaks along the kitchen counter tasting snacks with your back turned? Cured! Need to keep your dog or cat out of a room? It can be done easily. Need to keep them contained in a certain area of your home? This can be done too. 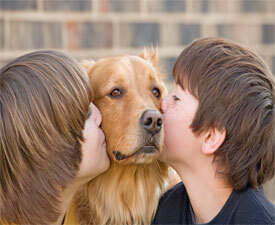 With the help of your professional Contain-A-Pet Dealer most any problem you have can be eliminated. All with sound conditioning principles. Call your local dealer for a free estimate. You will get someone who knows pets. You will get someone who knows pet containment. ... all at an affordable price for you and your family.